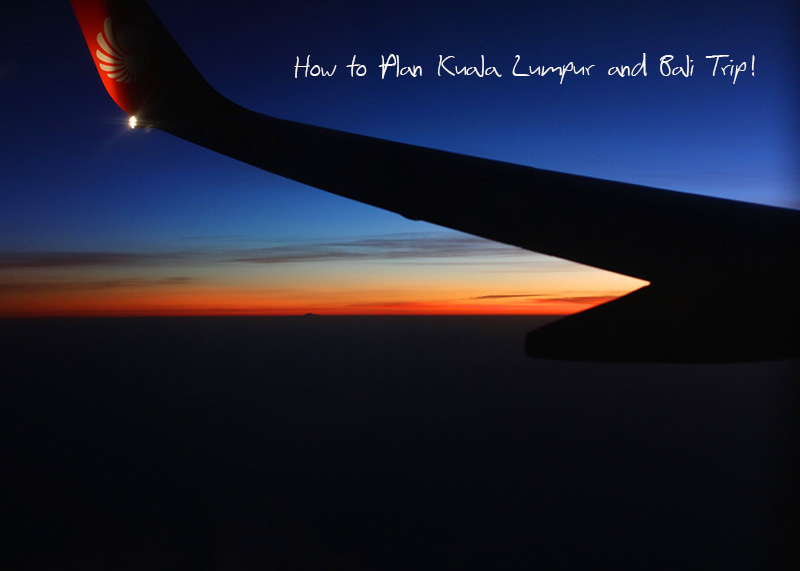 Here’s your cheat sheet for Kuala Lumpur, Malaysia and Bali, Indonesia. We planned our trip from makemytrip.com. They give you a dedicated team member who plan your itinerary. You can customise the trip as per your budget and requirements. You can look for group departures in order to bring down the cost. Malaysian currency is Ringgit. Do get some before leaving India because in the plane sometimes they accept only Ringgit if you want to buy food. Places to Visit : Bukit Bintang *, Petronas Twin Towers (book your tickets before hand if you want to go up on the bridge for the view), Batu Caves*, Cave Villas, Sunway lagoon Waterpark (it was under renovation when we went there), Thean Hou Temple*. Hotel We stayed at: Renaissance Marriot, Kuala Lumpur. Good food, great services, small but lovely rooms, gorgeous swimming pool and very well located. Walking distance from Petronas towers and Bukit Bintang and monorail station was right in front. Mode of Travel : Taxi and mono rail. If you want to explore Kuala Lumpur find taxi services online and book them for a day or so. Don’t book them from the hotel as that would be costly. Visa : to be done before hand. Places to Visit : Sacred Monkey Forest*, Ubud, King’s Palace, Tanah Lot Temple*, Kecak Fire Dance (must see), GWK Park, Padang Padang Beach*, Coffee Plantation, Uluwatu*, Pura Puseh Desa Batuan, Goa Gajah, Rice Paddy*, Kintamani Temple*, Lake & Mt Batur *, Pura Ulun Danu Bratan. If you have an extra day in hand and you are fairly fit, go for trekking on Mount Batur. Hotel We stayed at : Grand Mirage. Stunning property, great staff but you’d have issues with food there. Very less options for Vegetarians. Minimum days for Bali : Atleast 5 . 2 full days go into travelling. Malaysia to Bali flight is around 4 hours. And India to Bali flight is 11 hours (minimum). We had a connecting flight from Malaysia. So we left the hotel at 10 am and reached Delhi at around 11 pm. Our flight got delayed by 2 hours because of the weather. What to Shop : You can pick up some lovely art and craft pieces from Bali for your home. How you bring it back with you is something you’d have to figure it out. What to Pack : The basics for any hot and humid destination – airy comfortable clothes, sunscreen, bikinis / swimsuits, sunglasses, a camera. But the main are the shoes. Keep them very comfortable because there is a lot of walking in Bali. If you are going to rice paddy or trekking the Mount Batur, definitely pack a pair of converse / sports shoes with you. I didn’t know that we’d have to trek through the rice fields so I did it in my sandals only. Thankfully they were extremely comfortable and very sturdy throughout. Also, don’t wear dresses or skirts for rice paddy. Similar to Malaysia, we booked a taxi in Bali for three days and roamed around. We completely ignored the city tour arranged for us. This entry was posted in Travel and tagged Bali, bali cheat sheet, gow to, Indian fashion blog, indian travel blog, Indonesia, Kuala Lumpur, Malaysia, must visit places in bali, must visit places in Malaysia, travel. Bookmark the permalink. Sorry hv not been able to comment all these days.. Have been stuck with year ending n things n ppl go berserk in banks literally!!! But i hv been keeping track of all ur adventures n going gaga over the beautiful pics n beautiful u,Rati. U looking gorgeous in ur trip photos. And the first pic of this post is top class….Superb shot Sanjeevji.. . Infact love all of ur pics.. Esp those from the sacred monkey temple.. Bali happens to be also on my Must Visit List.. Thanks for the cheat list.. Would be of great help in planning..
What a lovely place…so much to see and do..
Yeah I am planning my holiday already…I don’t know when it will materialize..but reality cant stop me from planning.. The first pic is a stunner …how did u capture it ?? love the details. Agar plan kar rahe ho tho one should have details like this. makes it so easy for us. Thanks for putting together all this info. Am off to Vietnam and China. Infact I am at the Hyd airport as I write this 🙂 most of all am looking forward to the visit to the Great Wall of China. probably going to be the highlight of this trip for me. will put up pics on FB for sure (I know some friends of mine who make faces the moment I say pics but what the heck!! right???). wont commit to writing my travel tales on IMBB this time. 🙁 never seem to keep up my word. thanks for the details Rati.. well explained..
1. Langkawi- Firangipani.. it was very very beautiful. right on the beach, u get independent villas or hut, market nearby(walking distance).Open shower. I would say AWESOME. COSTED 28K FOR 3NIGHTS. all other five stars are very very far and you cannot go anywhere without vehicle but from here u can. Yay!! I am soooo excited Rati..Booked our flight tickets to Malaysia and Bali..Planning for 2 nights in Langkawi ! Will be staying in Bali for 4 Nights..We are looking to book the taxi as well..Hav seen d rates and there is quite a difference..say from 450000 to 700000..would u mind sharing howmuch driver Sumara charges for a full day tour..
Wow lovely! We are also planning a vacation..confused between Thailand and Bali. Which one would you suggest considering I am not so temple person? !